Coming From Severn House This Spring! Hannah Ives’s sister, Georgina, has some astonishing news. A DNA test has revealed she is part Native American, and Hannah’s test has similar results. The link seems to come from their late mother. But how? As Hannah dives into constructing her family tree, she uncovers a heart-breaking love story and a mysterious death, while DNA matching turns up two second cousins, Mai and Nicholas. Hannah and her niece, Julie, are eager to embrace their new relatives and learn about their surprising ancestry, but Georgina’s husband, Scott, isn’t so keen… Are more revelations about to come to light? 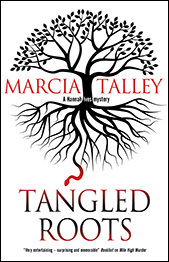 And can Hannah untangle her family roots to unearth the truth behind a devastating tragedy? It’s a fact that some of the cancer support group survivors Hannah Ives works with take marijuana. Recreational use of the drug may be illegal in Maryland, but a few patients, like Maryland State Senator Claire Thompson, are prescribed it on medical grounds. Claire has co-sponsored a Cannabis Legalisation Bill and invites Hannah to be part of a fact-finding task force that testifies before the Maryland State Senate. Before long, Hannah is in Denver, Colorado—the Mile High City—staying at a B&B with a group of pot pilgrims and medical refugees. But when one of the group is found dead, and a closer inspection of the body reveals the victim had been traveling under a false identity, Hannah is plunged into a dangerous cocktail of deception, drugs and death. 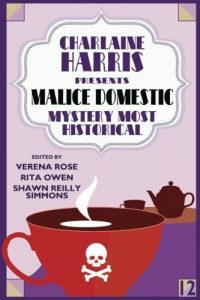 A new short story in Malice Domestic 12: Murder Most Historical! Photos in banner by Ron Belanger. 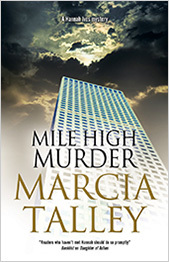 Marcia blogs at the Femmes Fatales, along with ten other best-selling crime writers. Read Marcia's posts every other Thursday at Femmes Fatales.